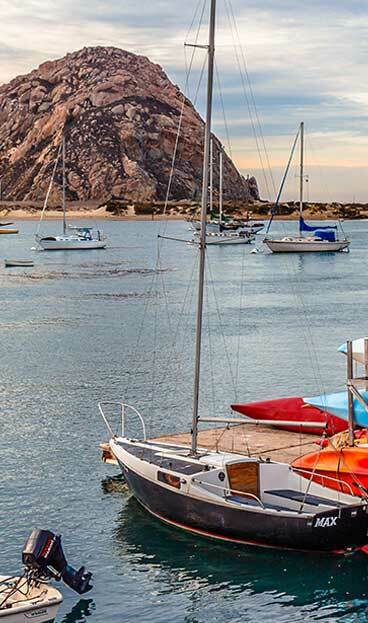 Now is the perfect time to visit Morro Bay. Our mild climate keeps the temperatures pleasant throughout the year. This means that winter and summer don’t feel all that different, but winters are less crowded. And with less visitors this time of year there are great deals to be had by those that do venture our way. Kick off your stay on Valentine’s Day. It’s a great excuse to celebrate all the relationships in your life—romantic, familial and friendships by making new memories with a trip. Pleasant Inn: book a room for Valentine’s Day and received a free romance package. This includes complimentary cider, roses, heart shaped swans, and balloons. The Inn is also offering half off Thursday night if the guest stays Friday and Saturday. Estero Inn: get a complimentary bottle of champagne if you stay during the month of February. Extend your romance with our Restaurant Passport: receive your book valued at over $100 in food and drink offers upon check in at any Morro Bay hotel or motel until the end of March. For a complete list of hotels click here. Earn brownie points with the wine lover in your life by booking a place at MCV’s Valentine’s Day Winemaker’s Dinner on February 14th or February 15th at 6pm. The evening includes five courses with paired wines focusing on Petite Sirah. Click to book your spot. Is vintage more your vibe? Head over to The Siren for a Valentine’s Day Spectacular featuring cabaret and circus sideshow performances. You&apos;re invited to dress to impress for a night back in time. You can find more information and get your tickets now. Get on the water for a Valentine’s Day Cruise with the Papagallo II crew. There will be live classic ‘60s and ‘70s tunes, an elegant dinner and a yacht cruise. Boarding begins at 5:45 pm and then sit back and enjoy the ride. Reserve you place here. If you want to keep your Valentine’s Day celebrations more traditional, Morro Bay has all the amenities for that too. Pick up some flowers at Harbor Floral. Stop at Kelli’s Candies for chocolate. And enjoy a three-course prix-fixe dinner menu at Window’s on the Water over their breathtaking views of the bay. Then continue the adventure and relaxation all weekend through President’s Day Monday. You won’t want to miss the 29th annual Big, Bad & Ugly surf invitational on Saturday at Morro Rock. And be sure to enjoy our walkable downtown full of original boutiques, artisan galleries and intimate dining options. Fill you days with kayaking, biking and hiking throughout our natural playground. Pause to grab a drink at one of our local breweries, bars, or lounges. And as the evenings approach, head to the beach to take in the sunset, relax by the firepits and take in the stars. For more advice on planning your getaway to Morro Bay, call the Visitor Center at (805) 225-1633.